A vote for Ted Cruz is a vote against that criminal-appeasing, “illegal”-immigrant-loving, terrorist-coddling, crony-enriching socialist in Gracie Mansion. Or at least that’s what the Texas senator wants New York’s Republican primary voters to think. 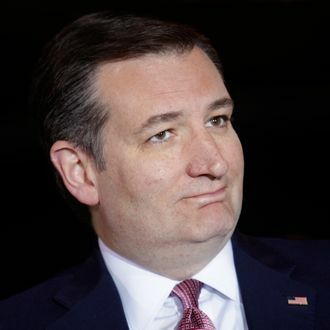 A wise man once said, “Senator Cruz is so mendacious in his remarks, one might fairly address him by the sobriquet ‘Lyin’ Ted.’” Okay, the unwise man who coined that nickname has never used the word sobriquet. But in this ad, Cruz lives up to his Donald-given name. The murder rate is not “up 10 percent” – in fact it was down 21 percent for the first quarter of 2016, as the city saw the fewest quarterly murders and shootings in its recorded history. Meanwhile, the NYPD is on pace to perform a mere 25,000 “stops,” down from a peak of 700,000 in 2011. Donald Trump remains the overwhelming favorite to win next Tuesday’s New York primary.